Sometimes one needs a break from the typical, and I appreciate your patience while I was getting my zoo creature fix. Sometimes we just all need a new perspective once in a while, me included. I needed a break- I hope you enjoyed my images from the Columbus Zoo. Back to our backyard. I've been feeding the birds throughout the summer. The black-oil sunflower seed is going quickly this time of year. But it's great to be able to sit on the couch, drink a cold one, and see myriads of birds in aerial maneuvers jostling for a position at the feeder. 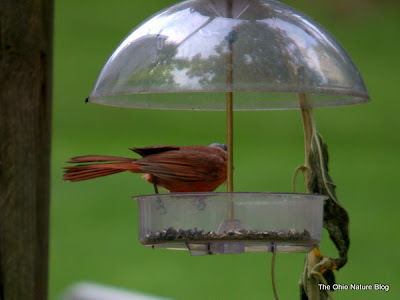 Do you remember when I had the first cardinal observation at our feeders here at our new house? (I need to stop calling it our "new house". We've lived here just over one year. It is now "our house".) Hard to believe that it took months to get birds to the feeders, but now they won't go away. 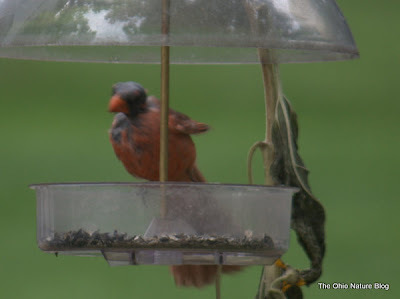 It just shows you how smart birds are- they know exactly where the great feeders are in a neighborhood, just like I know where my favorite places are across Ohio to stop and get a bite to eat while I'm traveling. Having a bird feeder close to your window is critically important- you'll just see more- more birds and more interesting behaviors. If you pay attention to my twitter stream, you may have noticed that I mentioned that an aberrant male Cardinal had paid our backyard a visit. What was unusual? It had a total of three, yes, three, twig-like feathers sticking out of its head, and the rest was completely bald. I had my binoculars, so I got a great view of the cardinal's skin- very dark gray, almost black, and kinda wrinkly. Wow was it weird, but I didn't get any pictures. 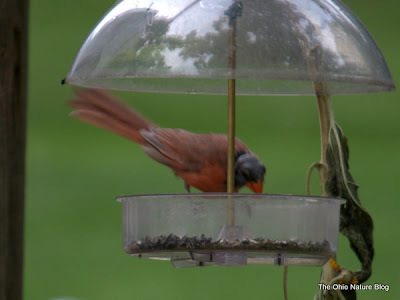 Fast forward a few days, and I'm sitting on the couch, and bam, the bald male cardinal is back at the feeder. I run to get the camera, and fire off a few shots, albeit pretty lousy ones. So I'm thinking to myself, why does this happen? Is the bird just molting? The answer, it turns out, isn't so simple. Some suggest that mites are involved, but I don't quite think anyone knows for sure why this happens. It may be a multitude of factors- parasites, overall health, a regular molt (birds shed their feathers- they get worn out). It doesn't seem to be exactly rare either, there are scads of reports and photos of this phenomenon. One of the best reports I came across, stood out from the rest. If Mr. Baldy has piqued your interest, then you must read installment #179 of "This Week at Hilton Pond", with absolutely amazing (but extremely ugly) photos of bald cardinals. I'm sure the cardinal is embarrassed lacking his head feathers, as our dog always was after a particularly close hair-cut. He looks a bit like a turkey-vulture but in miniature. Yuck! He would go well with my bald headed blue jays. What is it with crested birds needing to go with a bald pate? Megan- I wonder if it even knows that it is crazy looking? Kirk- Very interesting, I'd like to see pictures of bald blue jays, I don't think I've seen any, live or a picture...I should do a google search. Oh no! Poor Red! I hope his feathers grow back. I went to the site you recommended and saw the "lizard head" with one feather--poor Red again! I've got a couple of these bald cardinals. I've had a bald female several years in a row. They look so weird, but it doesn't seem to bother them much. 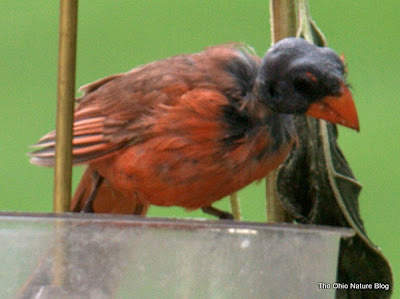 Here in SE Pa, we had "lizard-head" cardinals a couple of years ago, none last year, and now they're back again. Male and female both, and they are more skittish than the normal looking cardinals, who seem more assertive at the feeder. Could they actually be self-aware of their odd appearance? I've had a bird in my Virginia Beach wooded yard all summer that I couldn't identify. He looked just like a cardinal, but with a skinny blue neck and head. Turns out it is one of those rare bald cardinals. It seems well--and happy as it sings all the time. Its mate doesn't seem to mind his appearance as she is always close by. Really fascinating!